On July 30, the millet router family ushered in a new member - Xiaomi router 4C. The new product has four omnidirectional gain antennas, supports 802.11n protocol, and has a maximum transmission speed of 300Mbps. At the same time, it has built-in 64MB running memory, which can meet multiple devices in the home at the same time. It has a mobile APP, which can intelligently manage and use routers remotely. The price is 99 yuan (currently Xiaomi Mall discount price of 79 yuan). 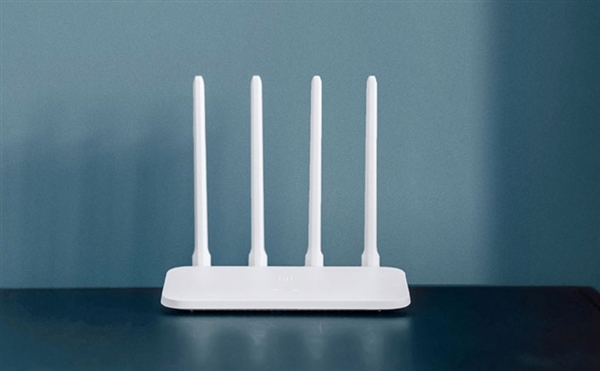 Xiaomi router 4C adopts white minimalist design, suitable for various home environments. The fuselage adopts multiple openings for natural heat dissipation. The signal strength of four antennas can reach 5dBi, and the signal transmission angle can be adjusted freely, effectively ensuring signal strength and coverage area. . Thanks to the 64MB running memory design, Millet router 4C can meet the stable operation of connecting up to 64 wireless devices at the same time Through the Xiaomi WiFi APP, you can remotely manage your home network on your mobile phone and check the network running status. 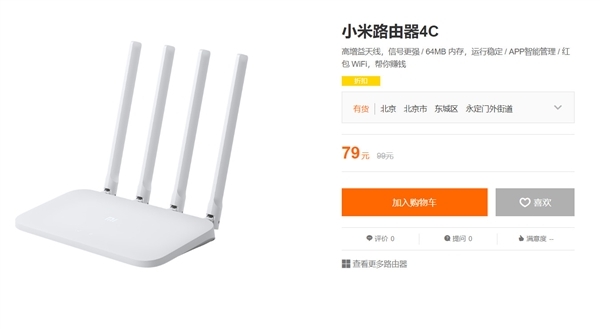 In addition, Xiaomi router 4C built-in intelligent anti-mite network function When the new device is connected to the network, the Xiaomi WiFi APP will automatically send a reminder, which can blacken one button to avoid the connection of strange devices. at the same time, Xiaomi router 4C also supports intelligent speed limit Automatic or manual optimization of the speed of multiple devices while using the network. You can also prioritize a single device, allowing it to monopolize more bandwidth for a faster Internet experience. 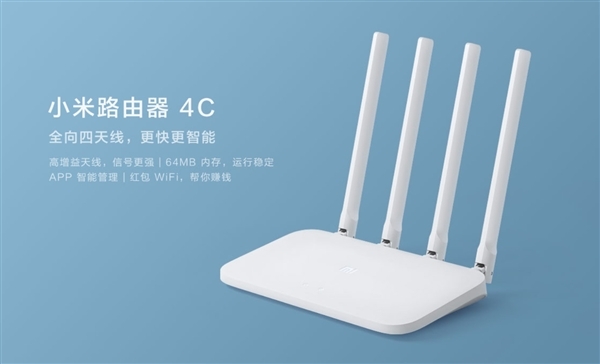 Xiaomi Router 4C continues the 'Red Packet WiFi' function of the previous generation products. When the network is idle, this function can be enabled. Those who need to access the Internet can connect through the 'red envelope reward' method, which fully utilizes the network resources, and the owner of the router can have additional income. From the built-in 1TB hard drive and support remote download of Xiaomi router HD (1299 yuan), Xiaomi router Pro (499 yuan), support Gigabit network of millet router 4 (199 yuan) to today released Xiaomi router 4C (99 yuan), The Xiaomi router series has fully completed the product layout from high-end flagship to entry-level. At present, Xiaomi Router 4C has been sold in Xiaomi Mall, Xiaomi Youpin, Xiaomi Home, Tmall Mall.